Managing Director and owner of Positive ID Labels, John Mayers, was proud to meet with Heather Wheeler, MP for South Derbyshire during the launch weekend of her “Better Off Out” campaign. 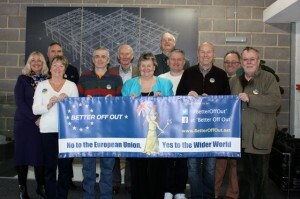 Local business owners and activists met at Positive ID Labels Offices in Melbourne on Saturday 5th March, before moving on to other events throughout South Derbyshire over the weekend. Many of the company employees share the view that the EU has lost its way; most notably with the horrific and drawn out collapse of Greece and more recently with the humanitarian disaster of refugees and the flood of economic migrants from African nations, the middle east and central Asia. We joined an economic community, the EEC. This has now mutated into the EU which is a failed entity. It has shown itself unfit for purpose on more occasions than I can remember. It is wasteful, ineffective and un-democratic and no longer represents the organisation we joined. The EU has achieved a lot of good things, the open market, environmental progress, shared stability in some respects. There is no reason leaving the EU but not the European Economic Area, should be detrimental to our trading arrangements. Anyone who says the Germans, Italians and French are going to put up trade barriers needs to have their head examined! Furthermore, any politician saying they need 8-10 years to re-negotiate existing EU free trade agreements with the rest of the world should probably resign on the grounds of incompetence! The EU has failed in so many areas and that is why we need to leave to get out of the fiasco. Common Agricultural Policy can never be reformed due to French interest; This means untouchable inefficient French farms and unnecessarily expensive food for us all. The absurd monthly move to Strasbourg cannot be reformed due to French pride who see the farce of up-ending the whole EU machine 400km south as impeachable. Attacks on the independence and competitiveness of London’s financial markets seem to be petty jealousy from our European neighbours and will not end. The EU’s handling of the Euro-crisis and the Greek financial collapse show the EU was at best asleep on the job when Greece got into the mess and the un-elected officials and Europe’s heads of state are not up to scratch dealing with it after the fact. Now we have the latest mess, the refugee and immigration crisis which as usual is being completely mismanaged by the un-elected elite at the Commission Headquarters. It is NATO, not the EU that are going to step up to the mark and fix things. Let’s not forget the fact that the EU has not had its accounts signed off for nearly two decades. If my business doesn’t sign off and submit accounts, we get into a lot of trouble but the EU seems to be above the laws it enforces! It is time to set the clock back to an economic union, not an un-ending federal project. The arguments about Britain’s security being at risk are preposterous. Look at the EU’s meddling in Ukraine which prompted the civil war in the east of the country. It is the EU’s expansionist policy that caused that problem but the un-elected officials soon washed their hands of their mess instead blaming Putin for the situation. Britain’s security is provided by our armed forces, nuclear deterrent and membership of NATO. Our intelligence services and Police co-operation is almost wholly done on a bi-lateral basis with little or no involvement from the EU. Leaving the EU will not affect those bi-lateral agreements and anyone who says we will be excluded needs to think through their arguments a little more! Leaving the EU would also give us greater control over our borders and who we choose to let stay or kick out of the country. The EU has nothing to do with our security and it is wrong for the pro-EU campaign to keep scaring people into thinking they do. We are being offered the option to “stay in” or “leave”. I think people should ask if they would want to join such a decrepit and dysfunctional political union. I have little doubt they would not! I would also emphasise that the second and third wealthiest European nations, measured by GDP per capita are Norway and Switzerland; neither being in the EU. And the wealthiest? Luxembourg which is a nation whose major service industry is EU bureaucracy!!! The referendum takes place on 23rd June 2016.